The gap between the rich and poor here is not a result of the Government's recent growth strategies; it is a problem Singapore has had since the 1980s. It then worsened in the 1990s even as families saw their standards of living rise, said Deputy Prime Minister Tharman Shanmugaratnam yesterday as he set out "basic facts" of Singapore's inequality story. 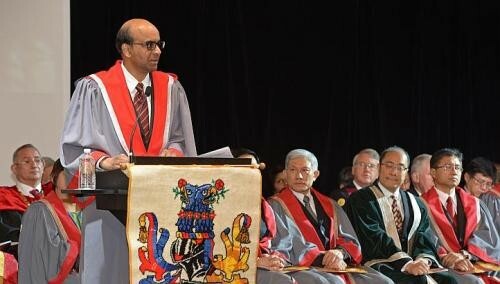 Speaking at a ceremony where he was conferred an honorary fellowship by the Academy of Medicine, Mr Tharman said that inequality here stems from the fact that Singapore is a city-state and is made worse by a phenomenal growth in education levels over a single generation. Noting that the proportion of students with only primary education has dived from 50 per cent to just 2 per cent in 30 years, he said: "What it means is that the older generation of workers, who had low skills and wages for most of their lives and who were part of the developing economy that Singapore was, now find themselves in a developed economy, where incomes of younger people are a world apart from what they grew up with. "As a result, we have both low and highly educated cohorts of workers in the workforce at the same time." This is seen starkly in the workforce where a disproportionate number of middle- and high-paying jobs are taken up by younger Singaporeans, while Singaporeans who are 55 and above make up half of those in the bottom 10 per cent of the working population. Thus, how education has transformed the labour force "has been the real drama of our first half-century", said Mr Tharman, who is also Finance Minister. But he added that the Government is helping those who were getting left behind. For instance, through schemes like Workfare and the Special Employment Credit, it is giving older low-wage workers about a 40 per cent top-up to their salaries. It is also urging employers to raise salaries for certain jobs at the bottom of the wage ladder. Even then, he made clear that though this spike in education levels exacerbated high inequality, it did not create the problem. "It (inequality) has always been high in Singapore - certainly since the 1980s," he said, noting that the country's Gini ratio was already 0.44 in 1980. Inequality then accelerated through the 1990s and the early part of the last decade, with the Gini ratio reaching about 0.48 in 2007 where it has stayed ever since. The Gini ratio, between one and zero, is a widely used measure of the income inequality gap in a society, with a coefficient of zero representing perfect equality. That inequality is inherent to Singapore is down to the fact it is a city and an open economy, with a concentration of talent and enterprise. The situation is therefore similar in cities like Hong Kong and Beijing, but with an important difference, he said: "In larger countries, if you do not like living with others in the city or if it gets too expensive, you move out to the suburbs. In Singapore, we are just MRT stops away from each other." But he stressed that inequality in Singapore has been accompanied by a significant increase in standards of living for most of the population. The bottom 20 per cent of households has seen incomes rise by about 60 per cent in real terms since 1990, while median income households have doubled their living standards. "Inequality does not mean that economic policies are failing," said Mr Tharman. Still, he noted that anxiety over income disparities is real: "With slower income growth, people feel less secure about their prospects, and it matters more when some people are doing better than others." And there are now the same tough realities facing developed economies with globalisation and technology raising competition and replacing jobs, while rewarding the very skilled. Thus, "established approaches... are being questioned and new solutions being sought".